This almond dessert is not too sweet with a creamy texture. It’s good for wrapping up your dinner or as a snack throughout the day. This is my childhood dessert that I often enjoyed with my dad in a little dessert shop in Hong Kong. The Hong Kong version of it yields those almonds for making Chinese soups, sweet almonds (南杏) with a little bit of bitter almond (北杏). The fragrance of the almond is so strong that makes you love it or hate it, similar to the case of celery and coriander. I love it very much. Well, it’s not the cup of tea for my family though. Almond is recognized as a healthy food. It helps lower LDL-cholesterol and reduces the risk of heart disease. I have been trying to add some almonds in my family menu. This time I opted for using the large Australian almond kernels. The smell is not as strong as the traditional almond dessert I used to enjoy. I like its mildly sweet taste with a cleansing feel. My family was very pleased and took a large bowl. Soak the almonds with enough water to cover them in a bowl for overnight. If the weather is too warm, keep it in fridge with cover. The next day, bring the 800 ml of water to boil and let it slightly cool down for later use. Soak the rice for 1 hour. Remove the almonds from fridge. Discard the water and rinse the almonds. Peel off their skins. Place the almonds, rice and the warm water in a food processor. Blend until liquified. Press through a fine sieve. You might like to use a cheese cloth if you want finer texture. Drain into a small sauce pan. Cook for about 15 minutes over medium heat. Stir occasionally. Add sugar and cook until it’s completely dissolved. Remove from heat. Stir in the egg white. Serve hot or cold. The consistency of this dessert depends on the amount of rice used. You might adjust the amount to your liking. You can increase or decrease the amount of sugar according to your preference. Can I replace the rice with rice flour? Don't use rice flour. The texture will be very different. Christine,thank you for your great advice and your generosity for sharing your great recipes. You're welcome. Hope you like this dessert as much as we do. Hi Christine! Looks delicious! Can you tell me what type of almonds you used? What's the difference between regular almonds, sweet almonds (南杏) and bitter almonds (北杏). I've seen recipes online where people only use sweet almonds while others use a mix of both bitter and sweet. Never mind! lol... I just noticed you explained it at the beginning. Thanks for the recipe. Will try to find the milder Australian almond to try. Good to include in our diet. This looks pretty tasty, I'm going to have to try this. Thank you! Very creamy and delicious! I need to make myself a large portion too. This is so good! I could eat this all day! Thank you so much! I also can use white almonds, isn't it? I made a double portion, because i knew it would be a hit:), but peeling off the skins of so much almonds took me quite long. But in the end it was really worth it!! You're right. For adding smoothness and more proteins. 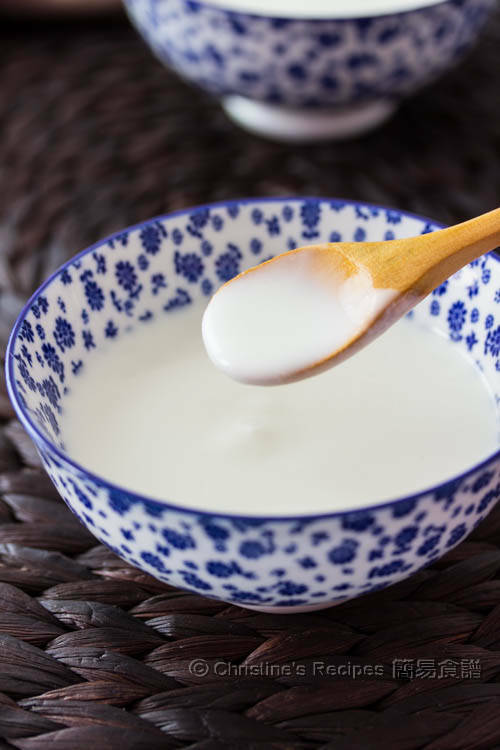 The older generations told us this dessert could help women keep beautiful skin. Awesome recipe . Has been trying twice but the second attempt which is double portion. The consistency was lumpy , why is that so? If your food processor is large enough to handle double portion, it shouldn't be any problem. Some people might use less liquid to process the almond, then it'd be a problem. The almond will turn into a paste. It create lumps in the dessert. I did it just now, really yummy. May I know why my dessert crack around the bowl? What to do with the leftover blended almond, wish to use in cooking, please advice. Thanks. Not quite sure what you meant by "crack"? The dessert should be a bit runny, not like custard at all. The leftover blended almond can be added to oats for breakfast or make another dessert. 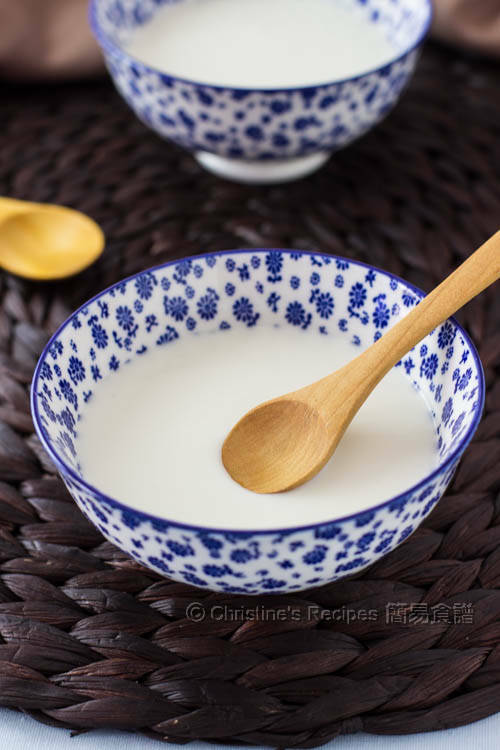 If I use Chinese almond, do I follow the same proportion as the western type? Can I boil the almond for a while so that it is easier to blend? Some recipes recommend frying the almond beforehand. What do you think? You may use the Chinese almond. Get the sweet ones (南杏) or mix a little bit of bitter ones (北杏) if you like. Simply soak them beforehand and follow the same steps. If you fry them, you can bring up some more fragrance. It's up to you. 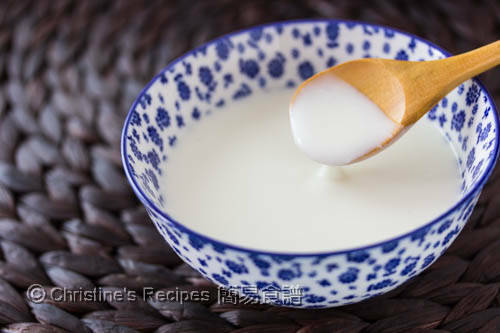 How to make Hongkong version of almond paste? Is it with Australian almonds & sweet & bitter almonds? In HK, sweet & bitter almonds are often used in cooking. Yet, not sure what kind of almond paste you're after. Sorry. Do u think is ok for me to mix Australian almonds with some bitter almonds instead? No need say sorry. 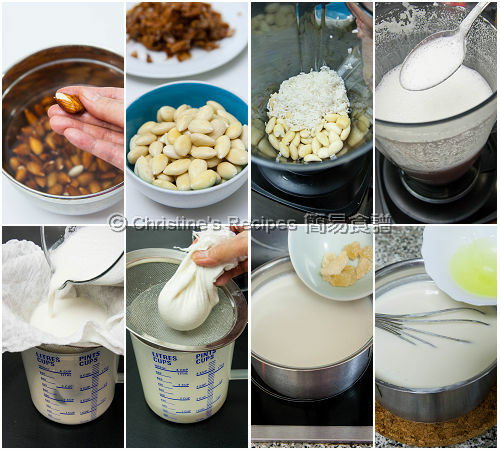 What i m referring is making almond dessert. I suggest you might use a small amount of bitter almonds. Otherwise, the dessert will taste bitter and weird. Too hassle to peel off the skin. Took me 2 hour to peel it off. Hope the almond dessert will turn out well. I m using Australian almonds. Now cooking. Sorry to hear that it took you 2 hours to peel the skins. It's strange. I also used Australian almonds, found it quite easy to get rid of their skins after soaking. Could it be not enough soaking time? Just curious. Hello, it took me two hours to Peel off the skin too. I was using Blue Diamonds regular almonds... In the end, the almond was not as fragrant as j had expected it to be; I wonder if it is because I was not using the Chinese variety? Really? Oh, what a tedious job you have done. You're right. The fragrance of Chinese almonds are much stronger. That's why they put some people off, others are attracted. Hi Christine, thanks for sharing this! As for the rice, is it cooked or uncooked rice? The rice should be uncooked in a food processor. After you ground the almond and the uncooked rice, you have to cook them for 15 minutes.